This duality, not to say duplicity, led to the idea of creating an “alternative system of trade financial transactions” to help the Islamic Republic sell its oil to Europe and buy European goods and services. German Foreign Minister Heiko Maas promised Tehran it would be” accommodated” in the global trading system. 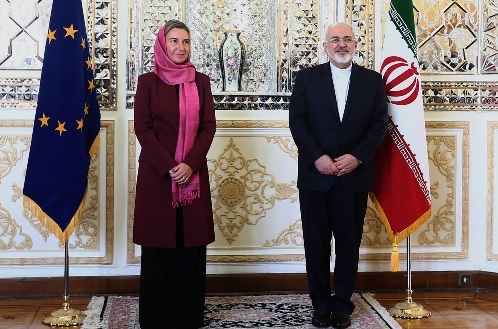 The EU’s special favorable treatment of the Islamic Republic includes keeping mum about more than 20 EU citizens currently held as hostages in Tehran. The favorable treatment is also indicated by the mere rap-on-the wrist response of the Europeans to the Islamic Republic’s latest terrorist operations in four European countries. Ironically, a more credible exposure of the destructive role that the Islamic Republic plays in Europe has come from Tehran’s former Ambassador in Berlin, Ali Majedi. Majedi is no defector or dissident. He is back in Tehran at the end of his Berlin mission, starting his retirement. The problem is that the Islamic Republic does not cross those real or imaginary “red lines”. Like the now-defunct Soviet Union in its time, the Islamic Republic’s strategy is to cross only “pink lines”, which constitute 99 percent of the norms of international behavior, whenever possible. In the EU countries, Tehran is careful not to cross “red lines”. But, it crosses “pink lines” when it can through mosques, hussainiyahs, religious endowments and fake charities. In Britain alone, the Islamic Republic controls at least a dozen tax-exempt “charities”, often used for financing violent groups across the globe or simply for money laundering. Part of the EU’s soft spot for the Islamic Republic may be inspired by endemic anti-Americanism which is present in most European political circles, left and right. We saw one example of this latent anti-Americanism last week over the crisis in Venezuela. When members of the Organization of American States (OAS) almost unanimously rejected Nicolas Maduro’s claim to the presidency and endorsed Juan Guaidó as Interim President of Venezuela, EU officials and media tried to portray this as another example of the US throwing its weight around. Thus, they began by saying they won’t follow that policy. Once they realized that the anti-Maduro front covered virtually the whole of the Americas and was not another instance of “bullying by Trump” they used duplicity to cover their mistake. They gave Maduro eight days to organize new presidential elections or risk seeing the EU back Guaidó’s claim as the OAS, including the US, had done. It was obvious that Maduro won’t accept what would amount to admitting the illegitimacy of his presidency. It was obvious that no election could be organized in eight days. It was also obvious that even if an election were held by an illegitimate regime it would have no legitimacy. Anti-American demagoguery had produced a laughable policy.